I was lying in bed the other night thinking, "I'm so weak. I'm so lazy. I have great ideas but never follow through." And so on. Like most of us, I can be pretty mean to myself at times. But then I stopped and realized that none of those things are true all the time. Sometimes they're true. But my real problem is discipline. I know what I need to do. And sometimes I even do it. But it's SO easy to let things go. Exercise. Project ideas. Healthy eating. Drinking water. Networking for my business. These are all things that I've blown off at one time or another for no good reason except I "didn't want to." I ask you: Is that the way to get things done? The word "discipline" struck me like a bolt of lightning that night lying in bed. 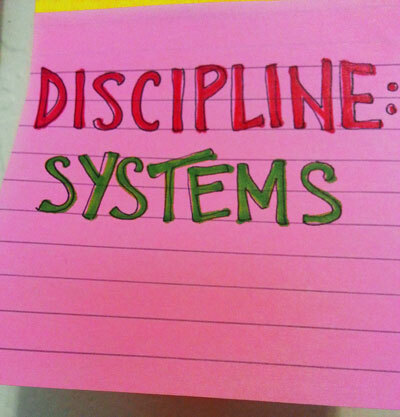 And coincidentally, I've been noticing a lot of signs pointing me toward creating better systems, which can only help me be more disciplined. Whether it's opening a separate bank account just for rent, or creating a launch calendar for a new program or product, I've found that systems are the best way for me to accomplish my goals. In 2011, I kicked off my first one-word theme year with the word ACT. And it forced me to do things I might not have done had I kept thinking about doing things instead of doing things. It's a more focused approach than writing resolutions, and I can apply it to all aspects of my life. I thought I had a theme word for 2012, but I see no sign of it anywhere, so if I had one, I quickly forgot about it. 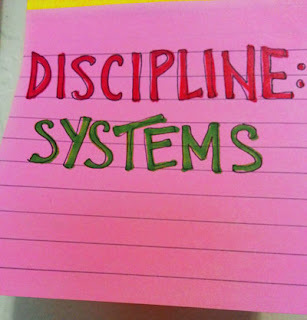 Onward to 2013, and keeping up my new tradition, my one-word theme is DISCIPLINE. And as a sub-theme, SYSTEMS. How about you? What one-word theme resonates with you? Is there a word that encompasses your goals and desires for 2013?